Value is real, substantial, discernible, but what constitutes value for one group might differ in subtle ways from what constitutes value for another. Those differences might also be radical, and that radical difference in how value is explained can be the flashpoint for conflict of the worst kind. Value is an experience: for some, it constitutes receiving more than one is required to sacrifice in an exchange; for others, it is the experience of fairness; others view it as the experience of things “as they should be”, whatever that may mean for the person or people in question. Because we seek value, and value is something about which we have a sense, we treat it as something that must be conveyed, communicated, carried across the divide between two distinct, or competing, world views. Money communicates value, but clumsily. Politics communicates value, also clumsily. Language communicates value, but usually through some complex of cultural specifics: we are a free country; we believe in participatory democracy; we worship one God; we honor religious liberty; we want to see imaginative innovators prosper, because they have produced something of value that serves others. These communications of value are also value judgments, estimations of value. Value is asserted, but how it is anchored remains a subject for debate. The declaration of principle, in such cases, turns into an argued proposition: we say this has value; now, we must go about demonstrating it. Language is a matrix of valuations, value-judgments, and of vehicles for communicating our sense of what has value and why. But more often forgotten than virtually any other aspect of the complex interplay of forces we might refer to as the approximation of value is that value itself is a vehicle for transmitting meaning. Jean-Jacques Rousseau wrote in The Social Contract that persuasion undermines legitimacy: to Rousseau, a pure assessment of the will of each individual should allow that individual to make any and all judgments in the absence of propaganda of any sort. So much political, theological and even academic language ultimately comes to the argument that you should think like I do, because I am telling you it is right, we tend to forget: it is also possible to win support for an idea simply because it directly enriches the experience of the other. A restaurant, for example, does not have to advertise its pancakes as “the world’s best”, if everyone who tastes them has the experience of being unable to stop thinking about how delicious they were. The experience of value spreads the sense of value. 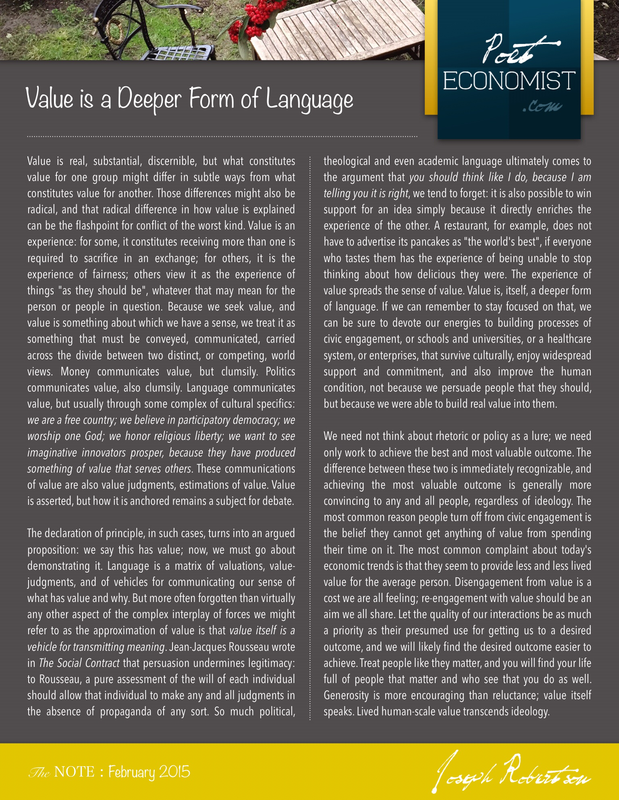 Value is, itself, a deeper form of language. If we can remember to stay focused on that, we can be sure to devote our energies to building processes of civic engagement, or schools and universities, or a healthcare system, or enterprises, that survive culturally, enjoy widespread support and commitment, and also improve the human condition, not because we persuade people that they should, but because we were able to build real value into them. We need not think about rhetoric or policy as a lure; we need only work to achieve the best and most valuable outcome. The difference between these two is immediately recognizable, and achieving the most valuable outcome is generally more convincing to any and all people, regardless of ideology. The most common reason people turn off from civic engagement is the belief they cannot get anything of value from spending their time on it. The most common complaint about today’s economic trends is that they seem to provide less and less lived value for the average person. Disengagement from value is a cost we are all feeling; re-engagement with value should be an aim we all share. Let the quality of our interactions be as much a priority as their presumed use for getting us to a desired outcome, and we will likely find the desired outcome easier to achieve. Treat people like they matter, and you will find your life full of people that matter and who see that you do as well. Generosity is more encouraging than reluctance; value itself speaks. Lived human-scale value transcends ideology.